KEF launches V720W soundbar and wireless sub system | What Hi-Fi? 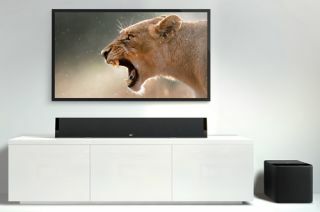 KEF has announced the launch of the V720W soundbar system, an £800 soundbar and wireless subwoofer designed for 47in and above TVs. First revealed at the Munich High End Show last year with the new KEF E Series eggs, the system comprises the V700 soundbar and V-20W sub. The soundbar has an HDMI input with audio return channel (ARC) as well as a digital optical audio input. Use the HDMI with an ARC-compatible TV and you can use your existing remote and get sound from any connected source. Four 11.5cm bass drivers and two 25mm tweeters take care of the sound. The V-20W sub meanwhile has a 20cm driver and a 200W Class-D amplifier. The KEF 'Tangerine Waveguide' speaker design is on board, as seen on the likes of the X300A and R100 speakers, which aims to help better disperse sound. Ideal for soundbars. The soundbar can be wall-mounted or placed atop an AV rack or other furniture, with supplied stands enabling you to adjust the angle of the speaker. There are adjustable EQ modes to help you tweak the sound depending on your placement, too. On/off, mute and volume functions for the soundbar system can all be controlled by your existing TV remote control, provided you use the HDMI connection presumably. The KEF V720W soundbar and sub system is on sale now for £800.